Cube 3 is can express your ideas come into reality as it is a very homely and stylish gadget. The printer can print so many options that one could not ever think of. 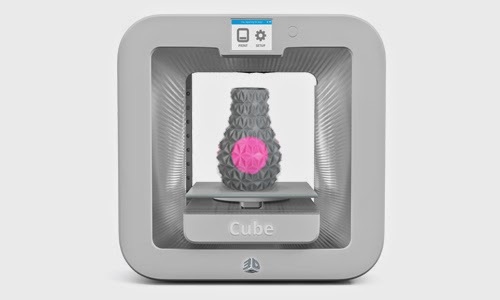 The Cube 3 printer was displayed in the Consumer Electronics Show in 2014 and then there was no looking back as that was the best choices in the 3D printing world. The most affordable printer and is developed to print big size objects like 6 x 6 inch in size. The printer not only has the best features but in the CES 2014, Cube 3 was the most stylish printers any one could see. The silver casting and the rounded corners of the gadget make it look trendy yet elegant. The Cube 3 can print in two colors and the material used to print is PLA and ABS plastic which are the two most common printing materials. They are the most robust and called as tough recyclable and compostable plastic. The printer can lay several layers of material to make a sold object which are approximately 75 microns of resolution. The best part of the printer is that the print jobs can be sent through the mobile also through the app. This app can also correspond with the 3D Systems online portal. This portal allows the users to share the designs, buy them and upload their own designs. The website also has collaborated with several artists by which their designs are available on the website for the customers. The Cube 3 printer can be used in home, school and office and is very safe for kids and adults. The printer does not have a door on the print area as it does not have a heated print tray. The printer is a great choice for people who are exploring the best 3D printing options.